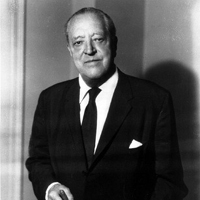 Born in Aachen, Germany, Ludwig Mies van der Rohe began his architectural career in Berlin and without formal training, rapidly gaining recognition as a talented architect. While in Berlin he worked alongside Le Corbusier and was also involved in the development of the Bauhaus school of design. In his post WWI career, Mies became synonymous with design minimalism and avant-garde modernism and is seen as a pioneer of modern architecture. His design ethic is encapsulated in his motto “less is more”. After serving in WWI, he began to take a more avant-garde approach to his work, in line with many others for whom the experience of the Great War had served to discredit traditionalist ideas and styles. His first and perhaps most famous modernist statement was his German Pavilion for the 1929 Barcelona exposition. Around the same time he became architectural director of the Bauhaus design school. The German Pavilion illustrated Mies’ concern with a developing simple, elegant design ethic, which used modern and efficient materials and methods of production in its realisation. The Pavilion had a flat roof supported by steel columns, with movable internal walls made of marble and glass. Mies brought this approach to his interior and furniture designs, as evidenced in his famous chrome and leather Barcelona chair, ottoman and bed, which were also exhibited at the Barcelona Exposition. In the 1930s he left Germany for the USA, where his architectural ideas were at last realised, most notably in the extremely minimalist Farnsworth House, and also in skyscrapers such as the Twin Towers (Chicago) and the Seagram building (New York). In 1968 his New National Gallery in Berlin was completed.